Breakfast at Hong Kong Restaurant. The restaurant itself is a famous steamboat in Cameron highlands (evening). Overall, it offers a wide selection of foods and menu items at breakfast. After filling up, short walk to Cactus Valley and back to hotel. Check out around 11.00 am. Heading to Lata Iskandar Waterfalls. 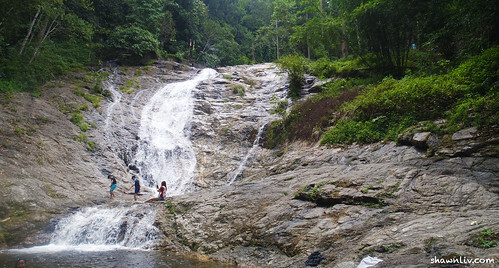 Lata Iskandar Waterfalls is one of the popular tourist attractions. 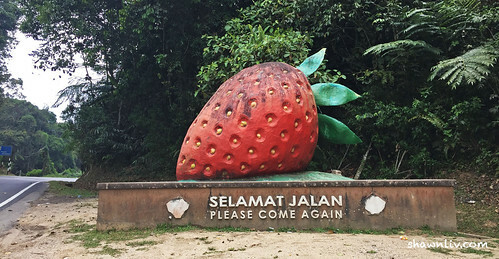 Stretched approximately in the midway between Cameron Highlands and Tapah. Lots of stalls selling food, drinks and souvenirs available along the roadsides. This waterfall makes a good photo stop on the way to JB. We’re going to Melaka for shopping and lunch. First stop at Freeport A’Famosa Outlet. Freeport A’Famosa Outlet set in an open-air mall featuring a lake, fountains, carousel and windmill with architecture loosely themed on Malacca’s Dutch heritage. At this moment, the open brands are Nike, Cotton On, Esprit, Puma, G2000, Carlo Rino, Clarks, Forever 21, Samsonite, Folli Follie and etc. This is the special version, which comes with a scoop of ice cream. Normal shake (without ice cream) is RM1.50 and special version one is RM2.00. The special version they serve carry good taste and flavored. Afterward, lunch at Chung Wah chicken rice ball Jalan Hang Jebat. As usual, their Hainan style steamed chicken with Rice balls tastes good. Last but not least, Teddy Bear Cafe (TBC) at 3rd Floor, Terminal Pahlawan. The cafe was quite well decorated and you can see Teddies everywhere, every corner. We ordered the milk + mocha cubes drink (RM12.90) and milk + Oreo cubes drink (RM12.90) were average. All in all, my wife love the atmosphere here. It’s Time To Go Home, See Ya.